PUNE/ MUMBAI: Torrential rains may have triggered the landslide on Wednesday that buried Pune's Malin village, but experts say short-sighted government policy and shoddy implementation of its schemes are the major underlying factors for the tragedy. Sahas Manch, an NGO working in the area, has blamed abject carelessness of government officials in measuring and levelling land for the Padkai scheme. Under this tribal employment project implemented under MNREGA, hill slopes are flattened and trees are cut down to develop cultivable plots. The NGO claimed that government officials did not survey the area thoroughly and allotted 25 plots on steep slopes. Land was levelled by uprooting trees, which in turn loosened the soil, stone bunds were not built to contain erosion and nullahs were not cut into the soil to allow drainage. Such criminal errors caused the landslide, it alleged. On the other hand, massive deforestation for a windmill project along the hillside was equally responsible, said acclaimed ecologist Dr Madhav Gadgil. The mud avalanche that ravaged the Malin village in the Pune district of the State of Maharashtra on the 30 July is hardly any different in its end effect from the rock avalanche tragedy which struck the village of Malpa in the State of Uttarakhand on 18 August 1998. Both obliterated the villages, located at the foot of their respective ecologically ruined, fragile mountain slopes, known to be unsafe. Of the comparable population of about 250 in the above two cases, 210 people were buried alive by the Malpa rock avalanche and the death toll in the case of Malin mud avalanche tragedy may not turn out to be significantly different. 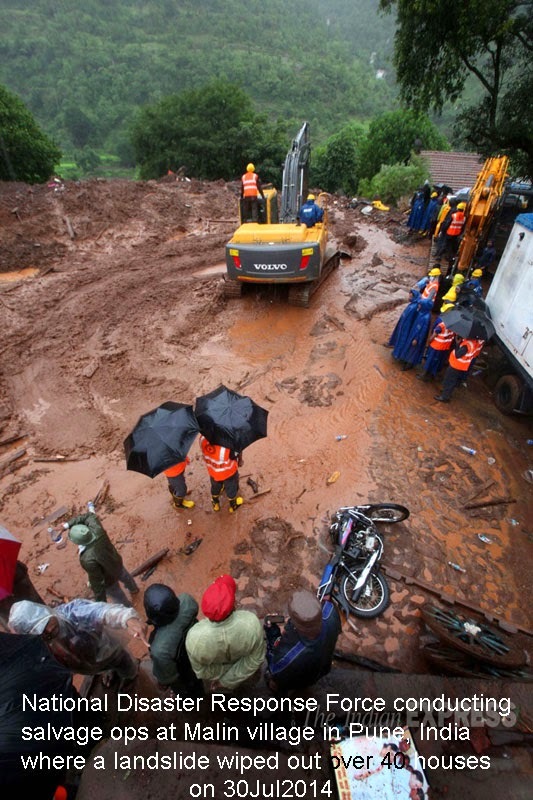 Rescue teams at Malpa battled to exhume those buried under the debris-cover as thick as 15 m and the National Disaster Response Force now has no easier task dealing with 7m thick muck at the foot of the Bhimashankar hill, fouled with bricks, thatch, gas cylinders, clothes and bicycle parts. The oft-repeated standard and stale reason put forward to explain the two ghastly events, is the rainfall preceding the events. At Malpa, the avalanche had struck in the wee hours of the 18 August 1998. On the previous day at 2130 hrs, rainfall resumed and by about 00: 37 hours, Malpa was completely wiped out of the map of Uttarakhand. At Malin, the tragedy occurred in the early hours of 30th July 2014 around 07:30 am, explained in terms of the rainfall of 108mm on the previous day. These are only half-truths as rainfall has been a seasonal visitor for centuries on end. In both the cases, the blame also fell on factors such as ecological fragility of slopes, deforestation, improper landuse, quarrying. At Malin, the government has, as usual, assured the victims of all possible assistance, payments to compensate for every life lost with assurance of rehabilitation of victims. Such declarations are familiar to our ears. In the next few months, it is not unlikely that Malin will be forgotten the same way as we have forgotten Malpa, until we get another jolt. The end of every tragedy is usually the beginning of the season of meetings, conferences, seminars and workshops. The ensuing debates on whether the disaster was natural or man-made and whether it could have been prevented naturally fade after generating a lot of heat but very little light. The post-mortem studies are more sketchy than scientific and these too end up with piles of reports and papers, which eventually gather dust on the shelf. guidelines issued by the National Disaster Management Authority aim at zero tolerance for non-engineered constructions and for flouting of techno-legal regime and yet no one raises even a little finger to investigate disasters , affix accountability , learn lessons and make someone accountable to ensure that the same mistakes are not repeated. The country has designated Geological Survey of India as the nodal agency for landslides but that declaration made years ago, and ratified yet again, remains a secret to most of the landslide victims, and our country men at large. The other questions that must be asked are why the tragedy could not have been avoided, and why the response was not quicker? The Malpa tragedy occurred at 00:37 am on the 19 August 2014. The thunderous sound of the rock avalanche was heard by many around 00:25 am. Five minutes later, sky witnessed fireworks due to colliding boulders. Closely on the heels of this came the fury of a dust storm. We had no preparedness to capture these signals and the first message of the tragedy could be radioed from the ITBP only at 05:25 am, and the real help came hours later. Why did we not learn from this? Like at Malpa, the residents of the neighbouring Asane village had sensed the incoming mud avalanche at Milan by the loud noise heard at about 03:00 am. There were evidences of howling wind as well, similar to the experience at Malpa. There being no early warning system in place, the village Malin too did not receive attention until a bus driver encountered the devastated landscape at 07:30 am, and the Manchar city authorities got the news thereafter. National Disaster Response Force (NDRF) personnel could also reach the site only by the afternoon. District collector reportedly came to know about the incident at 9am. We lost hours at a time we were short of seconds! Why no attempts were made to prevent abuse of land, educate the people on the perceived threat, do’s and don’ts, restore ecological stability to the area and disallow non-engineered dressing of the slopes for agriculture. Was it difficult for the government to keep a check on felling of trees and stone quarrying in the area , especially when landslides have been a common occurrence in this part of the district, and only last year, the neighbouring village of Kolthawadi was hit by a landslide. dynamics. We can understand landslides only by systematic geotechnical, geomorphologic, hydro-geological and seismic characterization of slopes, and study of the environmental impact of urbanization. The question to ask is-why then scientific investigations in our landslide prone areas are exceptions rather than a rule? The earlier we insist on prevention by taking recourse to scientific investigations, the better. 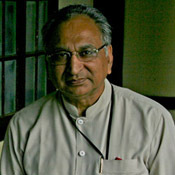 Prof RK Bhandari is a distinguished alumnus from IIT Mumbai, a Fellow of Indian National Academy of Engineering and a recipient of the coveted Varne’s Medal for Excellence in Research and Practice of Landslides.